Pamela Geller Discovers Fashion Jihad? Pamela Geller of the hate groups AFDI/SIOA has found yet another example of those devious Muslims attempting to sneak their Sharia compliant, evil customs under the radar of decent folks. Kaiseruddin hopes to build support for an “American hijab,” a headscarf that can have as many styles in a nation as diverse as America. And she hopes to shake up the belief that the hijab, and Muslims, are foreign to America, and show that headscarves are fashion accessories anyone—regardless of faith—can play with in their wardrobes. Perhaps she’s on to something. This disgusting and savage concept of modesty exemplified by modest clothing and head coverings can’t be allowed to be made to seem normal. Such deviant behavior could destroy the very fabric of America. Geller thinks this is “fashion jihad”. Geller has not noticed that it is not only Muslim women who are spreading such ideas and “trying to make the hideous fashionable”. “Orthodox Jewish women are taking fashion inspiration from style-star Olivia Palermo in an effort to shake-up their modest appearance. “... Most people in the world don’t understand the difference between ‘Hasidim’, Yeshiva Jews, or the Modern Orthodox. Without getting into details and an entire theological discussion, I’ll just say that, in my opinion, the main differences are based not only on the obvious exterior garb, but mostly the cultures of each sect, based on the traditions of their ancestors. But, in the end of the day we are all Jews. And we are highly misunderstood. So if I may be so bold, I’d like to share my personal opinion and point of view. Being an Orthodox Jewish woman is not in any way in conflict with being a relevent and accomplished woman in today’s world. And this is the underlying message of my blog: Balance. Beauty. Spirituality. Physicality. All done in a refined and purposeful way. ... But, never did I doubt the fact that G-d ran this beautiful world. All I had to do was look outside at the trees, the flowers, the gorgeous people…all different yet so much the same! And, in my humble upbringing, I was kindly and gently raised with the belief that He gave us a set of rules that were really for our own good. And just like we would be considered really crappy parents if we let our kids do whatever they wanted whenever they wanted…stay up all night, eat candy all day.. G-d gave us rules to keep us sane and happy, whether we understood or liked it or not. It’s no problem to replace observant Muslim woman with Orthodox Jewish woman, as these same sentiments are being echoed by both groups in America. And, just like the American Muslim community, the American Jewish community also has specialty shops selling high fashion modest clothing. Somehow, I don’t think that Pamela Geller will be objecting to any of these manifestations of exactly the same considerations that she objects to in the Muslim community. Her entire life is focused only on making sure that Muslims are despised, and marginalized. She has a following of people who, like her, feel more important when they can look down on others. About attractive hijabs, Mzungu says: That’s really dumb because if the whole idea of hijab is to be immersed in humility and diminishment then the fashion statements undo that. Its kind of like a fellow who announces to everyone “I’m humble!”. Gleaner1 says: As American as blue jeans eh? I don’t think so. American to my generation means rocking to the Beach boys singing California Girls. Time we confronted these Islamo-Nazis with OUR cultures. Watched Riverdance playing to the Chinese last night - Wonderful. I want to go to an “enriched” area and play Christian Carols at full volume comlete with Nativity scene. Your “enriched” areas, like ours, will not revert to their former status because muslims will see they dont. These areas are OUR ” East Jerusalem ” and ” West Bank “. We HAVE to reclaim them or watch them grow and become terror recruitment and training centers - even more than they are already. Fight them with OUR Cultural supremecy because OUR cultures ARE Supreme. NYConservative says: Why must we fight these miscreants in our own country? Who and Why brought these hostile foreigners into our country in such numbers? This is what needs to be exposed and debated. BEFORE we import another 10 Million of these traitors. PrayHard says: Hey, c’mon guys, those Islamic women gotta have something to cover up those cuts and bruises! Madeleine says: “Our form of dressing is a way of communicating [modesty] to others,” says Knight. Women should reflect their beliefs in the ways they dress, she says. “I see dishonesty in women who dress provocatively, but say they want to be known for their brains.” You know what I see when I see woman like Ms. Knight? I see fear, depression, mental illness, oppression, signs of abuse, dark cicles under the eyes, too much eye make-up on to over compensate, and of course very serious health risks such as bone disease, rickets,and vitamin D deficiency which can be passed onto Muslim children. One of her readers Meira750 does get it: “This sounds as if it might be something for Modest Orthodox Jewish women. I’ve heard of religious girls in Israel having to go to Arab stores to buy modest wedding gowns. Wigs are NOT modest and not halachic. We must cover our heads with a scarf. I’ve seen a lot of Arab women where I live who look beautiful in their abeyas and hijabs. Gorgeous fabrics and colors, smart shoes and bags and no niqab. The fashion industry with it’s skank wear has made it impossible for older women or religious women to look smart and fashionable. If someone can move the trend away from that, good for them. Clive Lewis, I don’t exist for your indulgent fantasies, sorry. That’s reserved for my husband. Go look at some Reubens paintings if you want to indulge your flesh. Mzungu, that’s where you’re wrong. It’s not about “humility and diminishment.” It’s about discretion, modesty and exclusivity to one’s husband. Just the same as in Judaism. There’s a fine line between humility and discretion, for sure, but it is the latter we are supposed to practice. The US could use a bit of humility, however. Your arrogance is stunning.” She will probably be banned from posting, but she is “right on”. Just in case Geller missed those classes in Jewish school, she might want to read two articles on My Jewish Learning How and when a Jew covers his or her head is a spiritual declaration and a nuanced social statement by Rabbi Adin Steinsaltz. PHOTO: Getty Images. AFP PHOTO/MENAHEM KAHANA Orthodox Jewish women visiting museum in Israel. 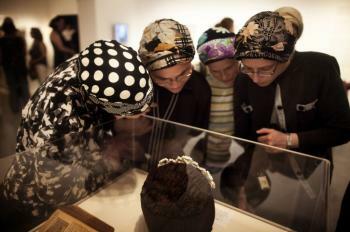 From article Jerusalem - Visitors Flock To Museum Exhibition Featuring Display Of 250 Years Of Hasidic Judaism.